I don't even... This is just... I can't believe... okay. Breathe. 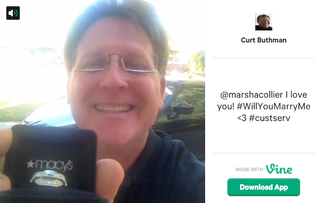 Some guy used Vine and Twitter to propose to his girlfriend. As in he recorded a six second Vine video (selfie?) asking her to marry him, with a ring and everything. She didn't say no.